Pet urine in the carpet can lead to a whole lot of problems for home owners. 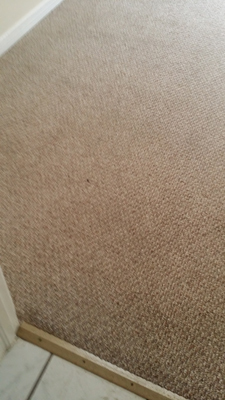 The primary issue is the health of the carpet and the residence. Pet urine is initially sterile when it's deposited into the carpet. The issues is that like most sterile mediums, once bacteria finds it's way in it will flourish and become more hazardous. All urine deposits in carpet need to be sterilized by a professional carpet cleaner to bring it back to a healthy state. The secondary factor is the pet urine odor. Pet urine crystallizes once it dries. Those urine crystals, sometimes called urine salts, start to absorb moisture out of the air and begin to off gas ammonia. You know when you walk into someones home who's pet is a bit randy and you smell the strong smell of urine that's the ammonia that is so pervasive. Pet urine odor is very difficult to remove from a home. The pictures above are from a Pet odor removal service performed by Chem-Dry of Tampa FL. 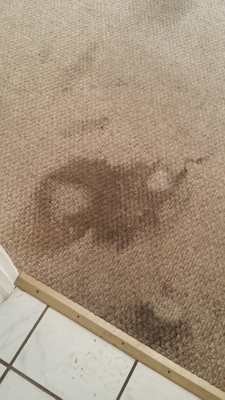 Even though the stain in the carpet was removed a specialty treatment was required to eliminate the associated urine smell. The problem is that the pet urine is not only in the carpet but in the carpet pad underneath. If the carpet stain is removed but the carpet pad is not treated then the urine smell is not going to go away. A professional pet urine removal service includes treating the carpet pad to remove the pet odor underneath. So if you get your carpet cleaned but you still smell pet urine it's time to bring in a specialist. For pet urine odor removal in Tampa FL call Chem-Dry of Tampa.